God had a talent for creating exceptional women--Helen of Troy and Cleopatra come to mind. So does Jacqueline Bouvier Kennedy Onassis, who lives again in this "warts-and-all" portrait. It's being released on the 20th anniversary of the tragic death, in 1994, of the icon who changed America's beliefs about what a woman of style, power, and influence could accomplish "behind the throne" of men whose careers changed the course of history. During her tumultuous life, she zealously guarded her privacy and her secrets, but in the wake of her death, more and more revelations have emerged about her frustrations, her rage, her passions, her towering strengths, and her delicate fragility, which she hid from the glare of the world behind oversized sunglasses. Within this posthumous biography, a three-dimensional woman emerges through the compilation of some 1,000 eyewitness testimonials from men and women who knew her over a period of decades. The public epitome of charm, grace, and elegance, the private, chain-smoking Jackie was known for her sharp wit and her acid tongue, dissing some of the great men and women she encountered. Examples include such figures as Nancy Reagan ("I heard she used to give the best head in Hollywood when she was a starlet at MGM"); Queen Elizabeth II ("pompous, stuffy, a heavy trip, and seriously pissed off at me for turning on Philip"); or Martin Luther King, Jr. ("a terrible man and a tricky, phony, skirt-chaser and race baiter"). This outspoken testimonial to the flimsier side of Camelot contains a cornucopia of gossip and intrigue, including details about Jackie's scandalous love affairs with her two brothers-in-law (Bobby and Teddy), and her penchant for movie star seductions (Warren Beatty, Paul Newman, William Holden). 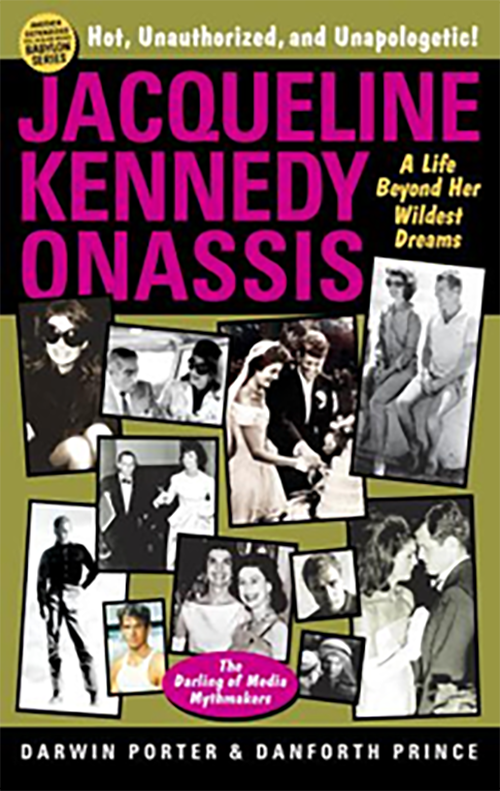 Also detailed are her famous feuds with Grace Kelly, Marilyn Monroe, and Maria Callas; her almost unknown love affairs with Spain's greatest matador and with Peter Lawford; her night in Georgetown coping with LBJ's aborted seduction; her friend Rudolf Nureyev's pursuit of both her and Bobby; her interchanges with Lem Billings, JFK's homosexual "First Friend" whom Bobby defined as "Jack's other wife"); her blood feud with Christina Onassis; her sibling rivalry with Lee Radziwill; her illicit affair with a senator nicknamed "Gorgeous George; her love-hate relationship with Frank Sinatra; and her Italian fling with Fiat's kingpin, Gianni Agnelli, who taught her all about La Dolce Vita during the summer of 1962. Conceived in direct and sometimes defiant contrast to the avalanche of more breathlessly respectful testimonials to the life and legacy of "America's Queen," this book is the latest installment in Blood Moon's endlessly irreverent BABYLON series.